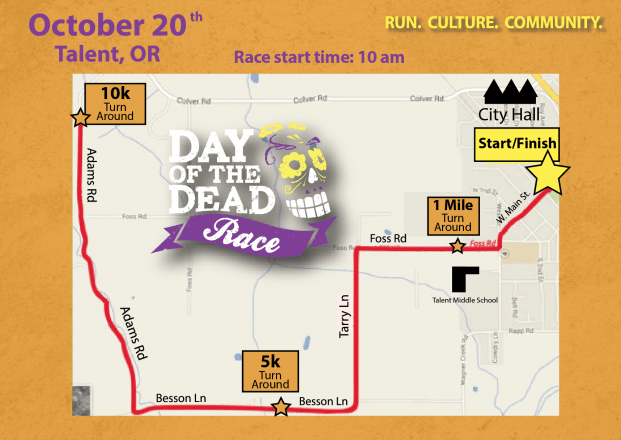 The 5th annual Carrera de los Muertos / Day of the Dead 5K, 10K, and 1 mile fun run will be held on Saturday, October 20th in Talent, OR. This event is hosted by NOWIA Unete, a volunteer-led movement of farm-workers and immigrants in rural Southern Oregon educating their community and advocating for worker rights, humane immigration policy, and full participation in the decision-making processes affecting their lives. Unete is the only Latino-led non-profit in the Rogue Valley. The 5K course is out and back with gradual inclines on the way out and declines on the way back.The 10K is a hilly course, described as “challenging”, with great views! There will be water stations start/finish, as well as at the 1-mile mark, 5k turn-around, and 10k turn-around on the course. 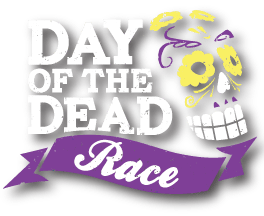 Overall winners and runners who finish in the top three places (male/female) in each race (1-mile, 5k, 10k) will be awarded a Day of the Dead hand made skull. Age group awards will be awarded a hand made flat shaped skull. Come for the race but definitely stay for the post-race festivities! There will be entertainment including mariachi, traditional folkloric dance groups, a DJ, and Zumba. There will also be authentic Mexican and Latin American foods, face painting, crafts and booths for kids; all in a traditional Day of the Dead celebratory setting. In keeping with the theme, the top 3 male and female finishers in each race will be awarded with hand made Day of the Dead skull! Be sure to follow their Facebook page here!